Our FREE APP is the quickest and easiest way to book your Hampden Car any time of the day or night. 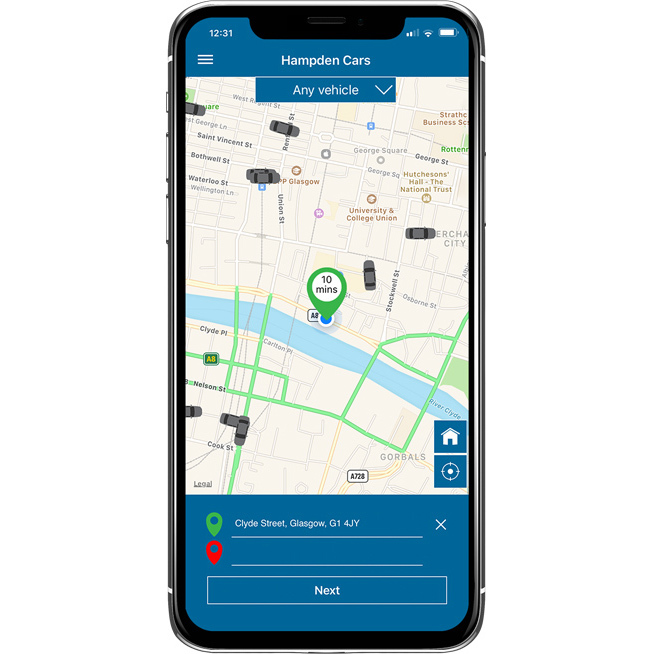 Our app lets you book, amend and cancel a cab, pay for your journey and will even show you when your driver is on route and how far away they are. Our special Buddy System lets you keep an eye on your friend’s taxi’s whereabouts should they be travelling alone. We are taking you places. We are proud to be one of the largest private hire & taxi services in Glasgow, covering all areas, citywide. We have a wide range of cars available to suit all requirements and occasions, operating a dual fleet of both private and public cars. Our service is professional, friendly and reliable, getting you from A to B in the fastest, safest and cheapest way possible. In accordance with law we have fully licensed booking offices in the Glasgow, East Renfrewshire and South Lanarkshire regions. We mainly cover the areas shown below although we can take you almost anywhere else. Spittal, Burnside, Rutherglen, Eastfield, Farmecross, Blairbeth, Fernhill, Springhall, Whitlawburn, Cambuslang, Greenlees, Drumsagard, Westburn, Carmyle, Blantyre, Uddingston, Broomhouse, Bothwell, Motherwell, Hamilton, East Kilbride East, East Kilbride West. Orchard Park, Waterfoot, Eaglesham, Busby, Clarkston, Stamperland, Williamwood, Netherlee, Giffnock, Crookfur, Mearns Cross, Mearnskirk, Deaconsbank, Carnwadric, Darnley, Nitshill, Kennishead, Eastwood, Barrhead, Paisley, Glasgow Airport. Hampden Taxi & Private Hire. We make it easy for you to pay for your journey. Whether it’s in-app payment, cash or card, contactless or mobile NFC, we’ll never charge you more than our regular prices. No surprises and no “uber bills” - That’s a Hampden Cars promise.